Human remains dating back almost 4,000 years have been uncovered on Rathlin Island off the County Antrim coast. Senior archaeologists are investigating the remains of a man who could have been buried in the Bronze Age. The skeleton was found in a crouched foetal-like position, which would indicate a cist burial in about 2000 BC. The body was accompanied by a food vessel. 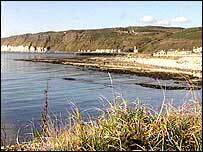 The remains were uncovered on Monday on the north coast, close to Rathlin Island's only pub, during work. Local people said they believe the bones are very old, and are similar to others which have been uncovered in the area over the years. Declan Hurl, a senior archaeologist with the Department of Heritage and Environment and Dr Colin Breen from the Centre of Marine Archaeology at the University of Ulster, are investigating the find. A spokesman for the Department of Environment stressed it was very early to give details but said this looked like a very significant discovery. "What they (the archaeologists) are looking at is the possibility of an early Bronze Age site," he told the BBC News website. "The find has just been identified in the past 24 hours. An initial report will determine whether the site can sustain excavation, given its precarious location," he said. People have been sailing to Rathlin for thousands of years. Other recent archaeological discoveries indicate the island may have been settled as early as 7000 BC, placing it among the oldest such sites in all of Ireland. A Neolithic stone axe factory uncovered on the pistol-shaped island's western tip dates from at least 4000 BC.